Form Description: Whether you are coaching a local youth team, coaching the high school team, or simply an interested parent that would like to help the team, it never hurts to keep track of the players. One of the best possible ways to do that is by having a completely filled out profile. 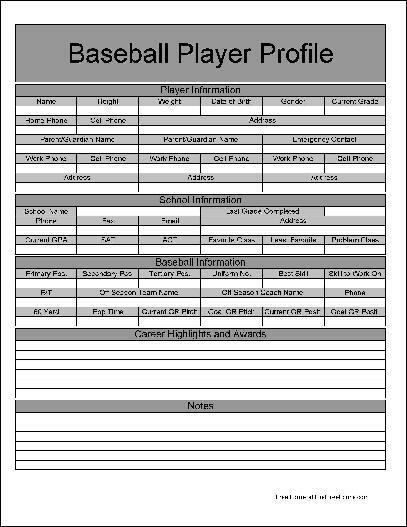 All you need to do is fill out this Basic Baseball Player Profile for each of the players on the team, and you will be well on the way to knowing where your team stands. This form ("Basic Baseball Player Profile") is associated with the following keywords: baseball, team, information, tracking, log, profile, basic.